An extended hospital stay and a passion for geography gave Byron the inspiration to help other kids learn and have fun — at the same time! Byron created the game Continent Race at age 6, during a month-long stay at Ann and Robert H. Lurie Children's Hospital in Chicago. Byron enjoyed helping Mrs. Ellen Donovan, of the Family Life Center, keep track of country medal counts during the 2016 Summer Olympic Games. Once the games ended, "Ms. Ellen" challenged Byron to create a game using flags. Byron took the challenge and ran with it! When he began creating the game, he immediately decided he wanted to create it for children in the hospital, so that they could play something fun AND learn while they recovered. The challenge sparked our son's imagination, lifted his spirits, and aided his healing. Thank you Ms. Ellen! During a month-long stay at Ann and Robert H. Lurie Children’s Hospital of Chicago, young Byron, just 6 years old at the time, was not only receiving treatment for an unexpected illness, he was receiving something else entirely: The inspiration to help kids like him learn and have fun through their hospital stay—and beyond. A portion of Byron’s Games profits benefit select children’s charities. PICTURED LEFT TO RIGHT: STEVE CURELO, STEVE ANDERSON (BYRON'S DAD), BYRON SIRAGUSA, ELLEN DONOVAN, KATIE KIM, JULIE SIRAGUSA (BYRON'S MOM). PHOTO CREDIT: KATHLEEN KEENAN/LURIE CHILDREN'S HOSPITAL. A special thank you to Mrs. Ellen Donovan for your passion and encouragement. Thank you to Ms. Kathleen Keenan for deciding to spotlight Byron's story and for your support. 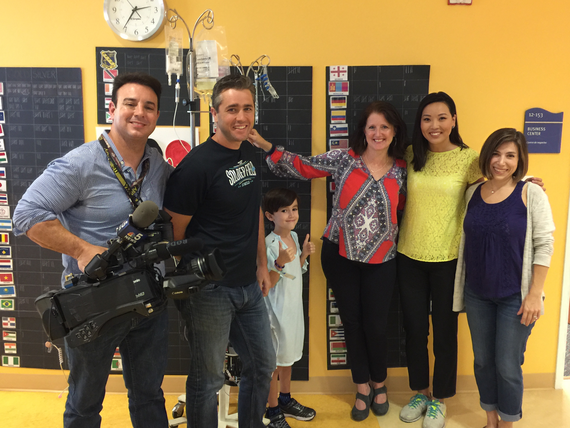 Thank you to Katie Kim and Steve Curelo of NBC for covering Byron's story and giving him such an uplifting experience. Thank you to Dr. Fizan Abdullah and team, including Katelyn and Laurie, as well as ALL the incredible nurses on the 20th floor—including Judy, Tye, both Rachels, Liz, Liesel, Kate, Molly, Anna, Rachel from Music Therapy, and Katie and Brittany from Child Life Service, Lara Priester from the Lurie Foundation, the Open Heart Magicians, as well as many others who cared for our son during his stay. Thank you to Dr. Diane Holmes from Town and Country Pediatrics. Finally, thank you to the family in Room 2003 for your encouraging words; we remain in awe of your strength and commitment. Thank you to Koleen Gregorio and Marilisa D'Angiò for your help on the flags and artwork. To Aimee Holden and hg3 websites for designing ByronsGames.com.